Although the general public has probably not heard of Tatiana Zelikman, her name is famous among countless musicians in Russia and beyond, for she is considered to be one of the finest pianists and teachers today. Zelikman trains the youngest pupils and gives guidance to the most experienced pianists, and over the years she has brought to light and then accompanied pianists such as Daniil Trifonov, Konstantin Lifschitz, Alexei Volodin and Alexander Kobrin, all pianists of rare talent who have become celebrities. While some of her students have enjoyed remarkable careers without ever having participated in any competitions, others have garnered the most prestigious prizes, including the Tchaikovsky, Van Cliburn, Busoni and Chopin competitions, and today perform on the major stages of the world. Many have also followed in her footsteps and become highly esteemed teachers in the most venerable musical institutions worldwide. No less a pianist than Yelena Gnessina – one of the three brilliant Gnessina sisters – personally wrote a letter to the director of the Gnessin School, a music school for particularly talented children, asking her to hire Tatiana Zelikman, who had graduated from the institute of the same name. This initiative is further testimony to Yelena’s exceptional artistic foresight. It should be borne in mind that the Gnessin Institute has trained musicians such as Evgeny Svetlanov, Evgeny Kissin as well as Boris Berezovsky. 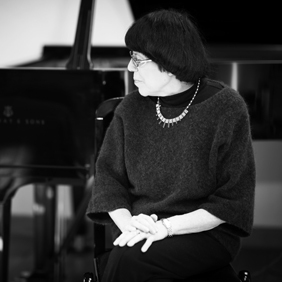 Zelikman not only proved worthy of Gnessina’s confidence; today she is one of the most emblematic figures of the Gnessin School and of the Gnessin Moscow State Academy of Music. Yet few people have been fortunate enough to hear her immensely talented playing. Her entire career, from the School to her higher studies in the class of Teodor Gutman, a disciple of the great Heinrich Neuhaus, has been characterized by a sound, a memory and an ear of rare quality, musical subtlety, and most important, a distinctive personality that shines through in her art of interpretation. Her repertoire included pieces by François Couperin, sonatas by Scriabin, several cycles by Schumann, sonatas and several themes and variations by Haydn, Mozart and Beethoven, Schubert’s impromptus, a number of works by Chopin; she had an insatiable passion for the music of Ravel and Debussy. Unable to practise daily because of a health issue that affected both hands, Zelikman seems to have been driven to devote her remarkable artistic potential to her students. Nevertheless, she has continued to perform in public, even though today her appearances are increasingly rare. This recording is a tribute to Zelikman. At last, we have a soundtrack of the poetic, luminous style of this unique artist, an outstanding representative of the great Russian school of piano playing.